The Washington Nationals will likely need MVP candidate Bryce Harper healthy all month if they are to make a postseason push, but he couldn’t even finish Wednesday’s game due to tight glutes. 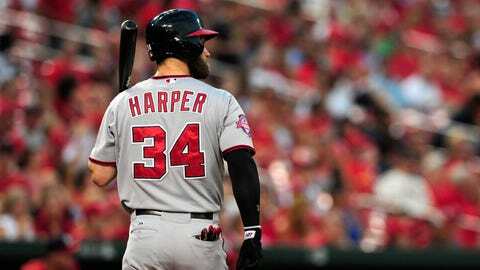 Bryce Harper of the Washington Nationals was taken out of Wednesday night’s game against the St. Louis Cardinals before the bottom of the fourth inning with tight glutes. Matt den Dekker replaced Harper in center field and was batting third for Washington, which was leading 2-1 when the NL’s leading hitter (.333 entering Wednesday) left the game. The Nationals won the game 4-3 behind Ryan Zimmerman’s two home runs and three RBI.